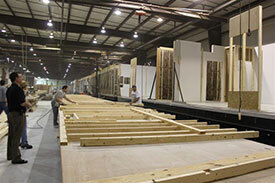 Individual modules are built off-site in a factory environment and assembled once on site. Modular temporary buildings can often be completed in half the time it takes to build a conventional structure because fabrication and site work occur simultaneously. See our section on How it’s Built for more information. Site is prepped while modules are built in the factory. While the site is being prepared, the factory is busy fabricating the modules. The project is ready for occupancy earlier than with traditional construction due to the concurrent construction activities.